"Mandrake Plays Cupid" is the 59th Mandrake Sunday story. The story was written by Lee Falk and drawn by Phil Davis. Mr. Grant, owner (?) of a theatre. 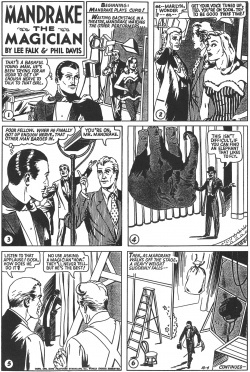 The story title is from the strip of October 4th, 1953 (Beginning: Mandrake Plays Cupid !). This page was last edited on 2 December 2017, at 16:24.